Memphis, Tenn. - Chris Parmelee blasted a first-inning homer and four pitchers took it from there as the SWB RailRiders (International League/New York Yankees) defeated the El Paso Chihuahuas (Pacific Coast League/San Diego Padres) for the 2016 Gildan Triple-A National Championship at AutoZone Park on Tuesday night, 3-1. SWB's first-ever overall Triple-A crown proved the first for the International League since the Columbus Clippers in 2011. Three straight hits started the home first for the RailRiders, who enjoyed home field by virtue of the IL's victory over the PCL in the Triple-A All-Star Game. Mark Payton singled, Clint Frazier followed with a single of his own and Parmelee sent them all home with a blast to right field off starter Walker Lockett (0-1). SWB starter Jordan Montgomery fired a pair of perfect innings before a Jose Rondon double and a single by former RailRider Nick Noonan started the third. Montgomery retired the next three in order to quell the threat. Montgomery (1-0) was lifted after three straight El Paso hits sparked the sixth, successive singles by Michael Margot, Carlos Asuaje and an RBI blow by Austin Hedges. Former San Diego prospect Johnny Barbato entered from the bullpen and started a string of 12 straight retired down the stretch by SWB relievers. Phil Coke was perfect in the seventh and eighth while Giovanny Gallegos fired a 1-2-3 ninth to cement the hardware and record the save. Season tickets for the 2017 season are now on sale. PNC Field in Moosic, home of the RailRiders, will be the place to be for the 2017 Gildan Triple-A National Championship Game on Sept. 19. The Mohegan Sun Pocono Hotel and Casino and PNC Field will serve as hosts of the two-day event. 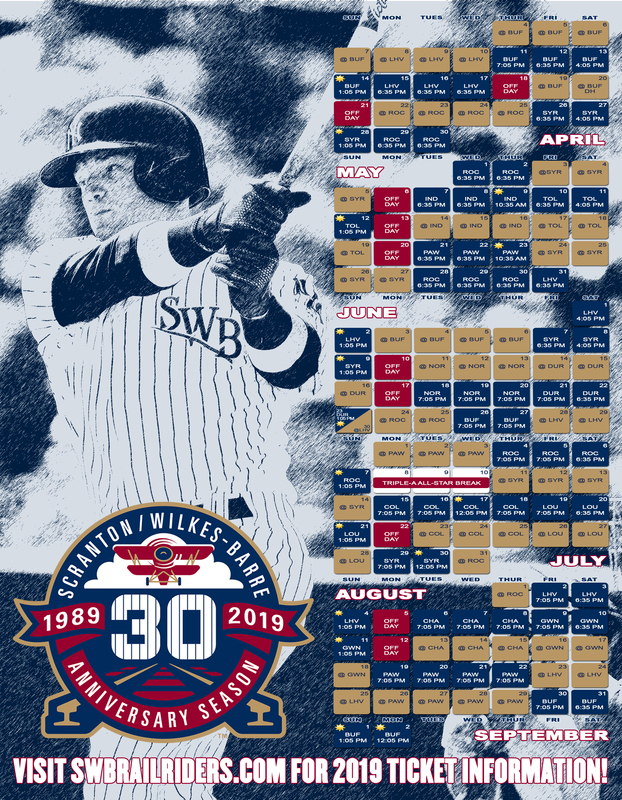 To purchase tickets or to find out more information, call 570-969-BALL (2255) or visit swbrailriders.com.